Welcome to MAGNETIC MIX OR MATCH JUNIOR the toy that lets you build a vehicle like no other. 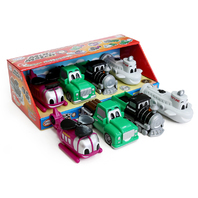 With these eight magnetic pieces building an imaginary vehicle like a Truck-Helicopter or Train Boat is a snap. Or, mix the pieces up then reassemble them by matching colors and MAGNETIC MIX OR MATCH JUNIOR becomes your child's first 3-D matching puzzle!